Nigeria coach Samson Siasia has left out in-form West Brom striker Peter Odemwingie from his squad to face Argentina and Ethiopia next month. Former England youth internationals Shola Ameobi and Victor Moses were placed on standby. The quartet of Austin Ejide, Yusuf Ayila, Yusuf Muhammed and Emmanuel Emenike were recalled to the squad. 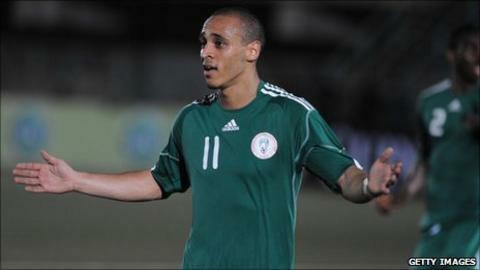 Odemwingie was dropped as punishment after missing the friendly against Kenya last month without permission. "He [Odemwingie] broke camp rule by leaving without seeking permission during our last match," said Siasia. "Until he comes back to explain why he did that, the national team doors are not open to him. "It was an act of indiscipline and we don't condone that." Odemwingie was not included in the team despite scoring 15 goals in his debut season in the English Premier League. Ameobi and Moses were placed on standby pending Fifa's approval on their application to switch nationality to play for the Super Eagles. Marseille left back Taye Taiwo, Fenerbahce defender Joseph Yobo and Chelsea midfielder Jon Mikel Obi were included, along with strikers Peter Utaka and Ikechukwu Uche - the two scorers against Ethiopia. Nigeria will face Argentina in an international friendly on 1 June in Abuja and then face Ethiopia four days later in a 2012 Africa Cup of Nations qualifier. Goalkeepers: Vincent Enyeama, Dele Aiyenugba, Austin Ejide.